How do you do to nourish your creativity? What do you do when your creativeness steps away? I joined "The Artist Way for Beaders" on FaceBook. Jennifer Chassalow VanBenschoten started the group. 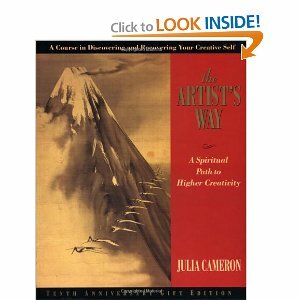 We are going to explore Julia Cameron's book "The Artist Way" and apply it to being a Bead Artist. I downloaded the book on iBooks. I made a decision when I joined the group not be a lurker hiding in the background. Armed with my iPad I was ready to begin. I had plans! My iPad was going to be my tool. I was going to use Pages on my iPad it to write my morning pages. The first day that is just what I did. I had a terrible time filling three pages with writing. Silly me! I started reading the first chapter. I realize I needed a notebook and pen. My thoughts needed to flow through my hand out of the pen onto the paper. It wasn't going to work typing my thoughts. It was to easy to delete a sentence or change a word or even the thought. It was hard work formulating a thought into sentence using the keypad. These words need to come from my heart and mind not from the tips of my fingers. I am going to do more than write my morning pages. I am going to blog more. I am going to learn to share more of my thoughts and my life as a Bead Artist. It's going to be a jounery. One I am ready to start. There is a lot to learn. A really inspiring and good decision :) Good luck in the venture. Glad to hear we'll be hearing more from you! I'm looking forward to seeing where your journey takes you!